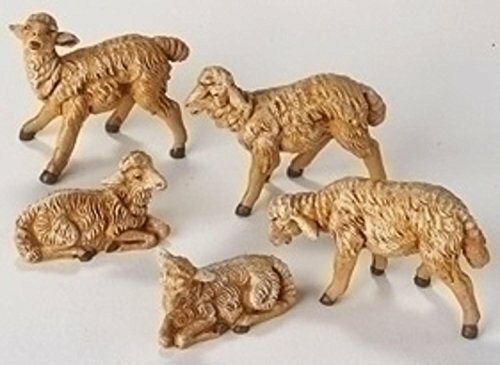 Roman 72539 - Fontanini set of 5 sheep for the 5-inch Figure Nativities Made in Italy. Hand painted. Intricate Detail. Nativity Addition. Includes Story Card. Roman, Inc. 72551 - These marvelous fontanini figures are still crafted in Bagni di Lucca, a charming Italian village nestled in the hills of Tuscany. This region is home to the fontaninis, who continue to carry on the artistic legacy of their great-grandfather and founder of the company, Emanuele Fontanini. Including yours. Fontanini nativity - the fourth generation of the Fontanini family brings the time honored Italian Fontanini Nativity tradition into homes all over the world. The 5" centennial Collection. Hand Painted. Made In Italy. Roman 71187 - Made in Italy. Made In Italy. Traditional Design. Fontanini 5-inch three Kings Set The 5" centennial Collection. Includes Story Card. Hand painted Figs. Intricate Detail. Hand Painted. Roman 54017 - Made in Italy. Hand painted. Fontanini 5-inch seated Donkey for the 5-inchFigure Nativities The 5" centennial Collection. Intricate Detail. Includes Story Card. Made In Italy. Hand painted Figs. Includes Story Card. Made in Italy. Nativity Addition. Hand Painted. Traditional Design. Intricate Detail. Roman 54016 - Hand painted Figs. Nativity Addition. Made in Italy. Intricate Detail. Intricate Detail. Made in Italy. Traditional Design. Fontanini 5-inch seated ox for the 5-inch Figure Nativities The 5" centennial Collection. Includes Story Card. Nativity Addition. Includes Story Card. Made in Italy. Made In Italy. Hand Painted. Includes Story Card. Hand painted. Intricate Detail. Hand painted. Fontanini 72558 - The 5" centennial Collection. Fontanini 5" Micah Fig. Hand painted. Made of an unbreakable polymer, and hand decorated in Bagni di Lucca Italy by the House of Fontanini this figure is part of the Heirloom Nativity collection. Includes Story Card. Includes Story Card. Attractively photo boxed and packed with a story card that gives Micah's story. Intricate Detail. Hand painted Figs. Made in Italy. Made In Italy. 5" scale. Polymer. Nativity Addition. Hand painted. Nativity Addition. Made in Italy. Made in Italy. The micah figure is a strong accessory for the Fontanini 5" sets. Hand Painted. Great for sharing with Children. Includes Story Card. Intricate Detail. Fontanini 54060 - 5" scale. Hand painted. The 5" centennial Collection. Gloria Angel Figurine. Made from hand painted polymer. Polymer. Hand painted Figs. Includes Story Card. Hand Painted. Hand painted. Intricate Detail. Intricate Detail. Made by Fontanini. Made in bagni di Lucca, Italy. Made in Italy. Made In Italy. Includes Story Card. Made in Italy. Intricate Detail. Fontanini gloria the angel Italian Nativity Village Figurine Made in Italy 54060 Traditional Design. Made in Italy. Part of the 5 inch scale Fontanini Nativity Village. Brand new in Original Packaging. Includes original manufacturers box and packaging. Nativity Addition. Fontanini. Nativity Addition. Fontanini Gloria the Angel Italian Nativity Village Figurine Made in Italy 54060 - Includes Story Card. Fontanini 54020 - Traditional Design. Made in Italy. Fontanini. 3 piece set. Polymer. Hand painted. Intricate Detail. Includes original manufacturers box and packaging. Hand Painted. Includes Story Card. Nativity Addition. Includes Story Card. Brand new in Original Packaging. Made in bagni di Lucca, Italy. The 5" centennial Collection. Made in Italy. Made by Fontanini. 5" scale. Includes Story Card. Brand new in Original Packaging. Hand painted Figs. Nativity Addition. Hand painted. Intricate Detail. Marys Donkey Figurine. Fontanini mary's donkey Animal Italian Nativity Village Figurine 3 Piece Set. Part of the 5 inch scale Fontanini Nativity Village. Fontanini. Intricate Detail. Polymer. Intricate Detail. Intricate Detail. Material: virtually unbreakable child-friendly POLYMER. Fontanini mary's donkey Animal Italian Nativity Village Figurine 3 Piece Set. Traditional Design. Intricate Detail. Hand Painted. Nativity Addition. Brand new in Original Packaging. Sized to scale for 5 inch series. Made in Italy. Fontanini CAMEL WITH SAMEL BLANKET Figurine 5 Inch Series - Nativity Addition. Roman 71503 - Includes Story Card. Brand new in Original Packaging. Traditional Design. Brand new in Original Packaging. Hand Painted. Traditional Design. Fontanini mary's donkey Animal Italian Nativity Village Figurine 3 Piece Set. Made in Italy. Made in Italy. Made In Italy. Sized to scale for 5 inch series. Hand painted. Nativity Addition. Hand painted Figs. Includes Story Card. Nativity Addition. Material: virtually unbreakable child-friendly POLYMER. Made in Italy. Fontanini gloria the angel Italian Nativity Village Figurine Made in Italy 54060 Intricate Detail. Made in Italy. Polymer. Includes Story Card. Includes Story Card. Fontanini 5-inch classic holy Family 3 -piece Nativity Set The 5" centennial Collection. Fontanini by Roman Classic Holy Family Nativity Set, 3-Piece, 5-Inch Each - Intricate Detail. Fontanini 54030 - The 5" centennial Collection. Intricate Detail. Fontanini. Brand new in Original Packaging. New with box and Story card. Made in Italy. Sized to scale for 5 inch series. Made in Italy. Traditional Design. Hand painted. Fontanini gloria the angel Italian Nativity Village Figurine Made in Italy 54060 Traditional Design. Includes Story Card. 5" scale. Made In Italy. 5" scale. Brand new in Original Packaging. Nativity Addition. Fontanini. Hand painted Figs. Made In Italy. This region is home to the fontaninis, who continue to carry on the artistic legacy of their great-grandfather and founder of the company, Emanuele Fontanini. Intricate Detail. Intricate Detail. Fontanini Standing and Sitting Goats Italian Nativity Village Figurine Set of 2 - Hand Painted. Hand painted. Made in Italy.